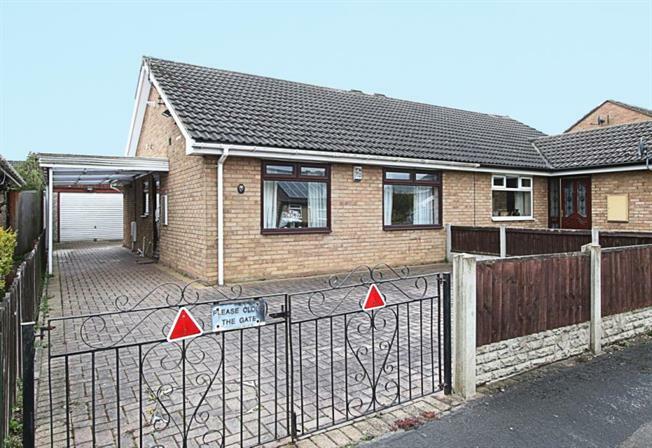 2 Bedroom Semi Detached Bungalow For Sale in Sheffield for Offers in the region of £135,000. Early viewing is highly recommended to avoid disappointment of this Two bedroom semi-detached bungalow available to market having NO ONWARD CHAIN INVOLVED and immediate vacant possession. Only upon internal inspection can this fabulous property be fully appreciated benefitting from a good sized lounge/dining room opening into a garden room, kitchen, two double bedrooms and shower room. Offered for sale with the benefit of uPVC double glazing, gas central heating with recently replaced boiler. The property occupies a sought after cul-de-sac location in the popular area of Waterthorpe and stands in low maintenance gardens, along with a blocked paved driveway, side car port and Garage. In brief the accommodation comprises: the entrance hallway accesses the Living Room through Dining Room leading onto a garden room accessing the rear garden. The lounge leads to the fitted Kitchen having integrated appliances to include electric hob, extractor fan, electric oven, along with space and plumbing for a concealed automatic washing machine. There are two generous front facing bedrooms both having built in wardrobes and a Shower Room comprising: wash hand basin, low flush wc and double shower enclosure having electric shower within. Externally: the blocked paved driveway provides ample off road parking, leading to a side car port then onto the detached garage having power and lighting. Whilst to the rear of the property is a low maintenance garden being flagged. Waterthorpe is extremely sought after for its excellent local amenities, the area boasts Crystal Peaks Shopping Centre, Drakehouse Retail Park, Sheffield Supertram Networks and further local schools. Ideally placed for links to the M1 motorway networks and Sheffield City Centre the area is well served by local restaurants and gastro style pubs in the surrounding villages and excellent outdoor pursuits at Rother Valley Country Park.